Pictured: The ADL, piloting the right TIE fighter. Rep. Keith Ellison (D-MN) is running for DNC chair. The ADL has thoughts on this. There are concerns, but there's also much that's positive in Congressman Ellison's record. The concerns should be addressed, the positives should be acknowledged, and at all points the conversation should be open, fair, and free of race- or faith-based innuendos. Not everyone likes thoughtful, balanced statements. ZOA had come out swinging against "Congressman Keith Ellison a/k/a Keith X. Ellison a/k/a Keith Hakim a/k/a Keith Ellison Muhammed." They were not happy that the ADL refused to jump on the bandwagon, and weren't shy about claiming "double-standard" since the ADL had condemned Steve Bannon (my post on the matter explains why I think that's a bogus comparison). Three days later, feeling the pressure, Greenblatt backtracked a little. Now, we could say that the IPT -- last seen bringing us that ridiculous "Muslim no-go zones" bit on Fox -- might not be a source worth taking at face value. We could express skepticism of whether that bit provides the full context. Nonetheless, I think it is fair from that clip to express worries. These are, indeed, worrisome remarks. They are a reasonable addition to the inquiry that Jewish and pro-Israel groups might wish to make into Congressman Ellison's candidacy. He should be asked to address them, and address them seriously. And an unsatisfactory answer would be a cause for deep concern. See, this is what happens when mainline Jewish groups have become conditioned to flinch each time right-wing groups go "boo!" They trip over themselves to show they're not "soft", and end up getting trapped in ill-thought out, ill-advised, and uncompromising positions. It would have been absolutely appropriate to raise these concerns, note that they raise serious questions, and then say "these comments demand a serious and thorough explanation from Congressman Ellison, which we will review very carefully" -- without flying straight into the "disqualifying" wall. Maybe Congressman Ellison would have a response that would assuage our justified concerns. Or maybe his response would be terrible, fully vindicating a conclusion that he cannot be supported in good conscience! Either way, notice how not locking oneself into a permanent position based on a brief audio-clip from six years ago leaked by a hatchet operation gives you a much nicer array of options. Putting aside whether it was fair to Ellison or not, taking away your own leeway to respond to any further developments is the definition of amateur hour. To quote de Talleyrand: "It's worse than a crime, it's a blunder." But no. The ADL panicked, and decided it was done without any consultation whatsoever. And now they're stuck. Fabulous work, guys -- this is why you're the professionals. 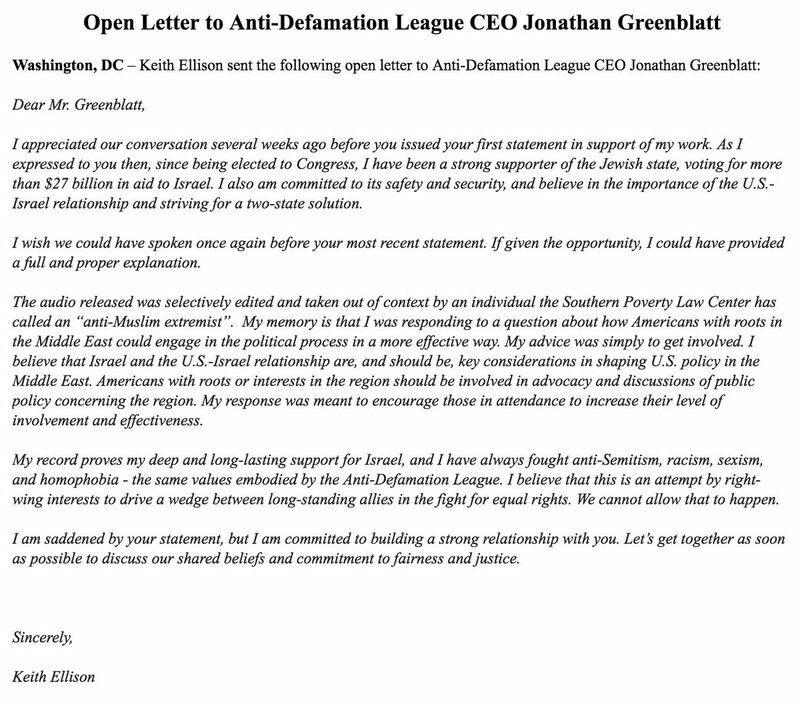 The really amazing thing is that Congressman Ellison's reply is far, far kinder than the ADL had any right to expect. This would have been a great letter had the ADL not elected to do the bull-in-a-china-shop thing. That it was issued after the ADL did so is the sort of gift from God that I hope the ADL is privately thanking each and every lucky star for. If they're supremely lucky, they can restart this conversation the way it should have happened all along. And yes, one element of that conversation should be to interrogate Congressman Ellison's statements. That's part of the tragedy here: the ADL's panic has deeply tainted the discussion we should have had. Ellison's comments were problematic. Perhaps context would mitigate their apparent meaning, perhaps not. Regardless, it would be worthwhile to explain, clearly and explicitly, why they were so troublesome, and see how he took that critique. I am not someone who will ever say that we should fail to call out anti-Semitism or troublesome tropes when we see them, and Keith Ellison is no exception to that rule. But there's no rule that vigorous opposition to anti-Semitism requires that one be an idiot about it. Part of the job of combating anti-Semitism is getting people who have made problematic remarks to disavow them and return to the fold. Groups like ZOA make that harder, because they rather the Jewish state have enemies they hate than for it to have allies they detest, so their strongest efforts are to ensure that Israel and the Jewish community stays in a constant state of implacable warfare against anyone to the left of Naftali Bennett. It's bad for Israel, and it's bad for the Jews. Yet the institutional Jewish community has a reflexive instinct to coddle a tiny right flank whose volume is grotesquely out of proportion to its numbers. Until the ADL weans itself from this habit, it's going to keep making very basic mistakes that undermine its effectiveness as an organization and its credibility as a Jewish communal leader. Some Jewish organizations have been deafening in their silence on Steve Bannon and the clear links between the Trump administration and the alt-right. I have been ... rather public in my denunciations of their decision. I am in broad agreement that there is a building revolution in the American Jewish community, and those groups which purport to be communal representatives while refusing to actually represent our community will rapidly lose the authority to speak as Jewish voices. But if a passable defense of at least the silent organizations (certainly not the ones, like ZOA, which have outright endorsed Bannon et al*) could be made, it is of the form taken by Shai Franklin in the Jerusalem Post. Franklin's basic argument is that there is and should be a "distribution of labor" within the institutional Jewish community. Groups like the ADL, which take on the role as anti-bigotry watchdogs, can and should condemn Bannon. But groups like the JFNA, which are primarily policy lobbying organizations, need to play a more cautious hand. Responsible for securing millions of dollars in funding for critical aid programs -- those which feed the hungry, clothe the naked, and take care of the sick -- the JFNA cannot decide to simply cut ties with any administration, even one as repulsive as Trump's. It has to grit its teeth and work with him as best it can. The bar for JFNA to condemn an action by the president – before he’s ever taken office, before he’s had the chance to issue a single executive order – must be very high. Condemning the president-elect’s choice for top policy official runs the risk of alienating him and his staff for the duration, squandering decades of cultivation and branding overnight. One might think that appointing a man who has provided a massive platform for the most dangerous and influential American White nationalist movement of our generation would clear that bar. But put that aside, and note the more subtle assumption. Franklin's column takes the view that condemning Bannon is tantamount to "boycotting" the Trump administration outright, that it would entirely throw away any ability to have any influence over government policy whatsoever. Maybe that's true, maybe it isn't. But note how it diverges from how Jewish institutions treat Democratic administrations. We don't fear that by criticizing this appointment or that policy from the Obama administration, we are permanently cutting ourselves out of the political loop. We trust that Democrats can tolerate dissent and disagreement, and so we can articulate our views openly and honestly, secure in an ongoing positive relationship. Unlike the mainstream Democratic Party, where Jews are deeply enmeshed and so can have difficult conversations without blowing up the entire relationship, the connection between Jews and the American right has been—at best—tenuous, contingent, and precarious. And so we’ve become accustomed to letting mainstream right-wing anti-Semitism slide, satisfied with the rote recitation “I am a great supporter of Israel” (surely, the right-wing variant on the leftist’s “I have always opposed all forms of bigotry…”). We’ve allowed ourselves to pretend that our fear of antagonizing these “allies” is a sign of the strength of our relationship, rather than its weakness. So, whatever the tactical merits of Franklin's position, it should at least make clear the monster we're dealing with. Groups which respect Jews, respect Jewish criticism. If the assumption is that Donald Trump cannot tolerate Jews telling him we're not okay with him hiring a hate-peddler, then the assumption is that Donald Trump is no friend of Jews. * The other question raised by Franklin's piece is what to do with the groups that have failed in the labor that is assigned to them? He includes, for example, the AJC as among the "watchdogs" that should be calling out Bannon. But the AJC has been almost defiant in its refusal to issue a statement, issuing bland platitudes about the importance of letting the President "organize his own team". What flows from this abdication of duty? What punishment is Franklin willing to endorse? If we're serious about the "distribution of labor", then these questions cannot go unaddressed. This, of course, goes double for groups (like ZOA) which have outright praised Steve Bannon. It's one thing to tolerate strategic silence of a few institutionally-oriented actors. It's another to accept the open endorsement of the sort of vicious hatred Steve Bannon represents. If Franklin is to be taken seriously, then he needs to have a plan for either roping groups like ZOA back into line, or initiating their very clear and very public disaffiliation from the communal Jewish tent. I feel bad for Trump-critical congressional Republicans. Really, I do. They thought that their efforts would be over after election day. In a Hillary Clinton administration, never Trump Republicans could go back to being regular Republicans. They could be a normal opposition party. To be sure, had they done this I think they'd have missed the lesson of their own experience -- Donald Trump was the fruit of "regular" Republican activity over the past eight years -- but it would have been understandable. Their labors would have been done. Instead, they have four years of Donald Trump. Four years where "opposition" no longer is just tongue-clucking in the New York Times, but actually will involve taking concrete action on the House and Senate floor. That's a very different animal. I'm not asking that Republicans suddenly become NARAL backers just because Trump is in office. But basic good governance regulations (such as reigning in Trump's conflicts of interest)? Those can't be allowed to slide. And, with Democrats in a state of rout, it is up to the Republicans in Congress. They can't fob it off on others.. Unfortunately, many congressional Republicans are indicating they have no interest in rising to the occasion. Rep. Jason Chaffetz (R-UT) has miraculously lost all interest in investigating the President after promising two straight years of investigation into Hillary Clinton had she won the Oval Office. Other Republicans literally run for the elevators when asked to discuss Trump's unprecedented ethical conflicts. It is an unacceptable abdication of duty. And it unfortunately betrays, yet again, the fundamental unwillingness of the modern conservative movement to take responsibility for itself. [M]any other Republicans downplayed the ethical concerns, noting Trump was still some two months from Inauguration Day. Many said they had faith in Trump and his family to make the right moves, and they insisted any problems that emerge would come out in the normal course of Washington’s checks-and-balances. "Hope" and "trust" are not part of the checks-and-balances schema. Our system of government is not based on "trusting" people in power to do right. It's based on the different branches of government taking it upon themselves to actively check one another, exercising their oversight powers fairly but aggressively. Seriously, read Federalist #51. In any event, while Democrats can do little things to hold Donald Trump accountable, it's ultimately up to the Republican Party to keep him in check -- or not. It won't be easy for them. It will involve constantly and aggressively tackling the leader of their own Party -- never a fun endeavor. Those GOP members who recognize how dangerous Donald Trump is may have thought they'd have earned a reprieve on Election Day. But in reality, their troubles -- like ours -- have only just begun. One of the main bases for my objections to the BDS movement is that the "train has no brakes." It might start with something facially defensible -- a targeted divestment from a firm that directly supplies occupation-supporting infrastructure, a narrow sanction directly attached to the settlements -- but almost never stays there. It keeps rolling, until it reaches flat bans on collaborating with Jews (Sydney, Australia), or open calls for the expulsion of all Jews (Durban University of Technology). Ryerson University, Toronto, has been a center of BDS activity in Canada. Earlier this week, their student council was scheduled to vote on a resolution commemorating Holocaust Education Week. The resolution did not mention Israel. It was also never voted on. A walkout led Students for Justice in Palestine and the Muslim Students Association deprived the meeting of a quorum, preventing the voted from occurring. And let's be clear: The reaction against commemorating the Holocaust is not isolated to Ryerson. It is part of a larger pattern whereby some see "the Holocaust not as a source of trauma but as a source of privilege, and an unjust privilege at that." When it comes to Jewish access to progressive discourses around equality and non-discrimination, the Holocaust "is the last firewall left standing; the last citadel the forces of Gentile Supremacy have not yet been able to overrun." The train has no brakes. It doesn't stop at BDS, and it won't stop at a "mere" walkout protesting Holocaust commemoration either. Board at your -- or more accurately, my -- peril. If there was a single day that characterized the conservative movement's relationship to the Obama administration, it was September 28, 2016. That day, Congress overrode President Obama's veto of the Justice Against Sponsors of Terrorism Act. Congress had passed the law earlier that month, ignoring the President's warnings that it opened up a massive foreign relations can of worms and placed American servicemembers and diplomats at risk of being haled into hostile foreign courts. President Obama followed through on his promised veto on September 23rd, and Congress promptly overrode the veto. Both the initial vote and the override were bipartisan affairs (the Senate and the House votes on both were overwhelming). But in the aftermath, once the issues President Obama identified now were encoded in law and presented a real and immediate threat, congressional Republicans took a very distinctive stance. They recognized the law had grave problems. But it wasn't their fault for voting for it. It wasn't their responsibility in drafting it. If anyone was to blame, it was none other than President Obama, who, they told us, was not sufficiently emphatic in communicating the bill's problems. It would have been astonishing if it wasn't so sad. A Republican Congress passes a bill over the President's warnings, then overrides his public veto of the same bill, and then has the chutzpah to blame the President for not doing enough to stop them. In reality, it was part of a pattern. The American right is fundamentally incapable of taking personal responsibility for its own decisions. Everything is someone else's fault. Everything can be blamed on someone else, usually Democrats or Democrat-leaning constituencies. It's never on them. Consider the ever-popular parlor game of "who's responsible for Trump's victory?" The left is indulging in its own form of this game, with the predictable factions deciding between "it's the fault of Bernie Bros and Jill Stein for undermining Hillary Clinton", "it's the fault of the neoliberal hacks at the DNC for rigging the game for Hillary Clinton," and "it's the fault of everyone who cares what non-White, non-male, and non-straight people think." To that debate, my contribution has been simple: the people responsible for the election of Donald Trump are the people who voted for him. Full stop. On the right side of the spectrum, though, this debate has taken a different hue. Much of the conservative movement has spent the last two years slowly transitioning from "it's an outrageous slander to say that a racist cartoon character like Donald Trump represents the conservative movement" to "it's an outrageous slander to say that the American conservative movement is 'racist' or 'cartoonish' just because it adopted Donald Trump as its representative." In between, the conservative movement treated Donald Trump as if he was some sort of inexplicable act of God, a deus ex machina whose surge to dominance in the conservative political movement defied all logic or rationality. He's a cipher, he's a reaction to Obama's own extremism, he's ... [hiss] really a Democrat. Whatever Donald Trump was, he wasn't their fault. And so when conservatives talk about why Trump won, they play the game quite differently. Why did Trump win? It's because of safe spaces and trigger warnings, Katherine Timpf declares in the National Review; Trump was "a long-awaiting contrast to the infantilization and absurd demands for 'safe spaces' sweeping our society." Nay, says George Will, it was academia as a whole -- their books are full of "pretentious jargon" like "interrogated" and "problematized" and their courses have silly titles like "Jews in American Entertainment." Jonah Goldberg attributes Trump's rise to the media "crying wolf" -- how could anyone have known that Trump really was that terrible, given how untrustworthy our newspapers have been? None of these persons, from what I can tell, is a Donald Trump fan, which makes their commentary all the more striking. They recognize what a terrible choice Donald Trump is, but whirl about seeking to blame everyone but those who chose him. This is pathological. Even if every critique the right had about, for example, liberal academia was entirely on target, is it really the case that a middle-income suburbanite in Dubuque decided to vote Trump because of how Wesleyan students want their classroom syllabi structured? It's implausible that it is true, and it'd be deeply pathetic if it was true. And to the extent that -- abstracted out to a broader commentary on "kids these days" and coastal elitism -- it is even part of the explanation, it's more pathetic still. "Just because the media says Donald Trump represents an unprecedented threat to American civic values doesn't mean he is one; and I don't feel the need to figure that out myself when I could be sending a message to those snot-nosed Ivy League teenagers who think they're so much better than me!" Who is patronizing who here? This is the politics of a temper tantrum. There's certainly no notion of personal responsibility, that conservatives have duties to cause and country that exist independently of what media figures say or liberal youths do. Instead, conservatives are treated as creatures of instincts; minor children who are scarcely capable of independent reason. They lashed out, and now blame liberals for being inadequate babysitters. Republican voters, we're told, are helpless in the face of the grave insults they face from ... 19-year old bloggers living across the country. Minorities in cities they never visit. Professors at schools they don't attend. Nobody who has any real power over the conditions of their lives, mind you. No matter: they just had to respond. The backlash was inevitable. Certainly, they can't be expected to have independently come to the conclusion that Donald Trump is a menace. In these circumstances, nobody can reasonably hold them accountable for the decision they made in the ballot box. The ur-form of this must be the very favorite explanation for why Trump won: That White Americans were sick of being criticized for racism, for sexism, for xenophobia, for not being perfect little egalitarians. Liberals insisted on holding Americans to account for these sins, and Americans deeply resented them for it. Eric Holder called us a "nation of cowards" around the subject of race, and White people railed against him even in the course of proving him absolutely right. And so, under this story, Trump won because he offered an alternative where Americans didn't have to feel guilty about any of these things: They could mock minorities, swap stories about assaulting women, demand an American free of non-Christians, and they'd be okay, even justified, in doing so. There is a very literal form of emotional regression at work here. I was a pretty well-behaved kid growing up, but like anyone else I sometimes misbehaved. Sometimes I was inconsiderate or hurtful, or mocked or insulted people. And when I did do those things, my parents made me own up to it and apologize. I didn't get a ton of "this is what it means to be a man" type parenting, but if ever I got it, this was the context. Part of being a man means manning up and taking responsibility when what you're doing hurts other people. Of course, as anyone who's gone through this knows, it's not fun. It made me feel bad, and the actual act of apologizing felt even worse. As a kid, just learning these lessons, you're very susceptible to being in denial about the whole thing. It wasn't really your fault, the other guy had it coming, they deserved it, I was right, they were wrong, my friends got away with it -- anything to avoid owning up to the mistake. How easy it would be to fall in with a pied piper who endorsed that entire line? The reason we have to teach children to take responsibility for their actions is because the alternative is very, very tempting. We expect adults to know better. To the extent our nation has and continues to commit wrongs along the axis of race, of gender, of religion, of disability -- and we have, and we continue to -- we should have the maturity to look it in the eye and take responsibility for it. That doesn't mean always accepting blame. It does mean fairly taking one's share of it and -- more importantly, in the case of complex political issues -- being open to the difficult conversation such issues provoke. Donald Trump's appeal was precisely in offering the opportunity to circumvent all of that. He held out a choice that would be understandably appealing to spoiled children, but should have been beneath the dignity of a mature democracy. Turns out, it wasn't (or turns out, we weren't one). And it's hard not to think that part of the reason why is the legion of commentators who have been eager to explain why those persons who did choose to align themselves with Trump -- a notorious racist, a flagrant misogynist, a man whose only qualification to lead our nation was that he was openly in contempt of half it -- could be excused for it. It's not their fault. It's not their responsibility. You want to talk about infantilization in American culture, this is the place to start. American conservatives have gleefully regressed to a state of childhood. They spent years acting out and then wonder why someone else didn't protect them from the consequences of their own actions. At some point, America cannot move forward unless we collectively grow up. Part of that will involve conservatives -- especially conservatives who have recognized the perils of the Trump movement -- accepting responsibility for the choices their faction has made, and holding their colleagues to account. Is that day coming? Now, of course, conservatives control both houses of Congress and the President-elect. They hold the levers of American government. And -- just as we saw over the last two years -- there are right-wing voices who do recognize serious fissures in our democratic fabric. Noah Rothman in Commentary frets about "the normalization of intemperance or even fanaticism" we have recently begun to witness. So, now that their fruit has fully bloomed, will conservatives finally take responsibility for it? What does Rothman say? Alas: "[D]on’t blame Donald Trump or his voters for this condition. Blame the left."